Is your next company anniversary coming up? What a great reason to celebrate! Of course, you’ll need the right promotional gifts. After all, not all anniversaries are the same, and you want your visitors to remember the occasion fondly. Promotional apparel, such as a polo shirt with your logo , is perfect for employees with customer-contact. Caps are also great promotional items for your events. 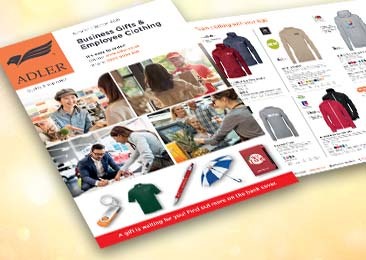 Our tip: it’s best to print up larger quantities of business gifts, as caps, shirts and promotional pens are popular among all target groups. To ensure that your promotional anniversary items are a hit, you should think about who exactly you want to appeal to first. 1. Which promotional items are suitable? 2. What is your budget for the anniversary-related promotional items? 3. What is your budget for the anniversary-related promotional items? When will you be celebrating your next anniversary? Order your promotional items in time! Many companies only celebrate milestone company anniversaries and don’t give out ballpoint pens, rollerballs, torches and other business gifts for each individual company anniversary. Others prefer to “celebrate occasions as they arise” and organise events for each and every company anniversary – events that bring them a lot of positive attention and, ideally, a boost in sales. Why wait for another five-year event when you can celebrate the company’s anniversary every year? When it comes to celebrating the employee anniversaries, the promotional-item strategy is less important than actually recognising the contribution your staff has made since joining the company. A printed photographic cake is a promotional item that creates unforgettable anniversary moments. Matching sparklers and cocktail napkins round off the event. This makes company get-togethers with employees a memorable occasion – and not just for the recipients of anniversary gifts, such as a personalised​ personalised cigarette lighter. With our promotional items, exclusivity is guaranteed. Promotional gifts are also perfect for demonstrating your appreciation for employees who just clinched a deal. As an experienced retailer of promotional items, at ADLER we are happy to help you choose the prefect products for an anniversary, and help you design these so that your new business gift achieves the optimum promotional effect. Anniversaries always occur at the same time each year, making it as easy for you to purchase your business gifts. By contrast, farewell gifts for loyal, long-serving employees often need more long-term planning. Luck for us, the digital world doesn’t let us forget an anniversary. In the ADLER business gift shop, you will quickly find the perfect promotional items for important occasions. We show our customers which gifts are suitable for which recipient. Farewells are always difficult, but with beautiful promotional gift you can considerably sweeten the retirement of long-serving members of staff. Ultimately, there is a business gift for every occasion. But you are probably already aware of this if you have ordered personalised promotional items from ADLER in the past for trade fairs or as employee Christmas gifts. However, our promotional gifts can be used for all kinds of occasions. Whether it’s an anniversary, birthday or retirement, our wide range of business gifts – from printed pens and caps to special gifts such as robust cigarette lighters – guarantee you a great promotional effect while making their recipients truly happy.